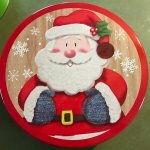 Holiday Themed Tin Cans filled w/ Goodies! Add Cookies, Brownies, Lemon Squares, &/or Chocolate Covered Strawberries + More! Call us at 706-410-2253 to customize your gifts today!